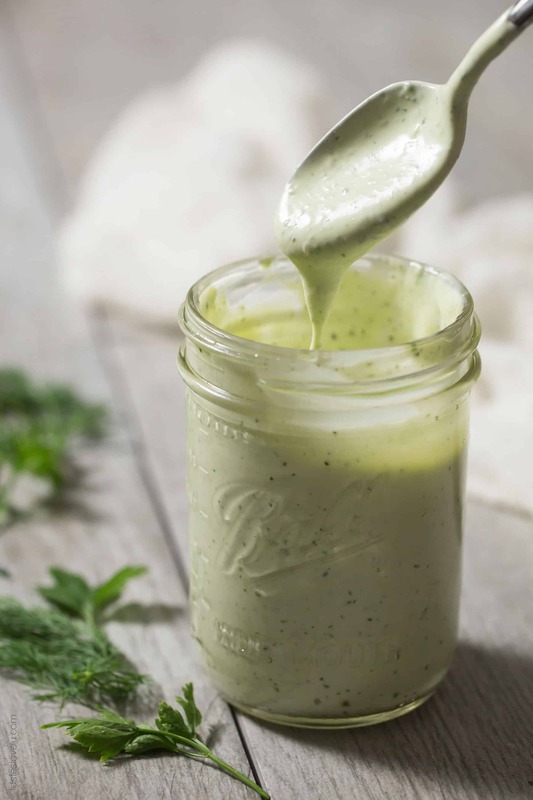 Homemade Paleo & Whole30 Ranch Dressing using homemade mayo, almond milk, and fresh herbs. 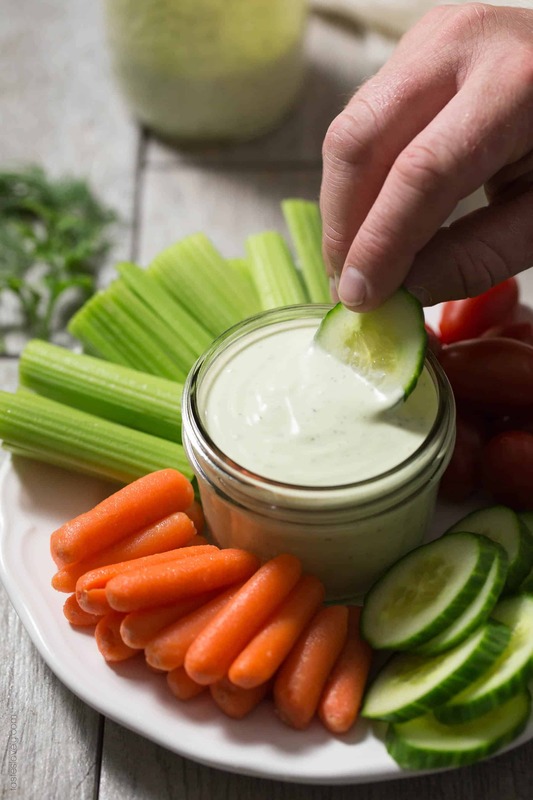 The most delicious dairy free ranch dressing or dip! I am absolutely in love with ranch dressing. It is my go to salad dressing, as well as dip for just about anything. Veggies, potato wedges, even as a topping on burger patties. Before, my go to homemade ranch dressing used cows milk, buttermilk powder, store bought mayo made with soybean oil, and dried herbs. I was determined to come up with a delicious paleo, Whole30 approved and dairy free ranch dressing. And I did! And I like his homemade ranch dressing WAY more than any ranch I’ve made before, had in a restaurant, or bought at the store. This one beats them all. And it is so incredibly healthy and fresh! It starts with my homemade paleo and Whole30 mayonnaise. So easy to make. If you haven’t made this one yet, do it! It’s one of the most popular recipes on my blog with tons of comments from readers who have made it and loved it! After I make that, I add in some fresh herbs. My favorite herbs to use are parsley, dill and chives. I grow all of these herbs in my garden, mostly so I always have them on hand to make this ranch dressing. Along with the fresh herbs, I add in a little bit of garlic powder and onion powder. When I’ve made this with fresh garlic and grated onion, it’s too strong. I actually prefer the dried powders more. They add the flavor without the sharp bite. Then I add in some of my homemade paleo and Whole30 almond milk, and blend it up. 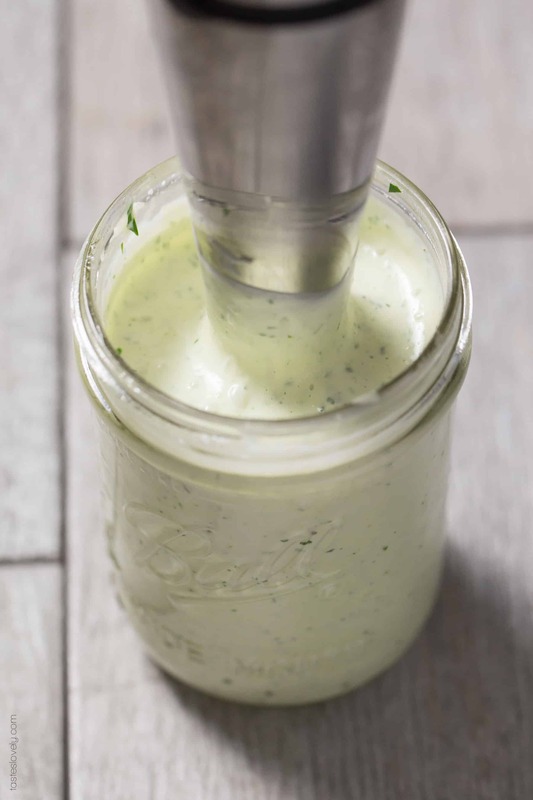 Just like when making my homemade mayonnaise, I make this ranch dressing in a wide mouth pint size mason jar and blend it together with a hand immersion blender. This is the easiest way for me to make it. I’ve already got the mayo in the mason jar from making it homemade, and the immersion blender is already out from making the mayo. 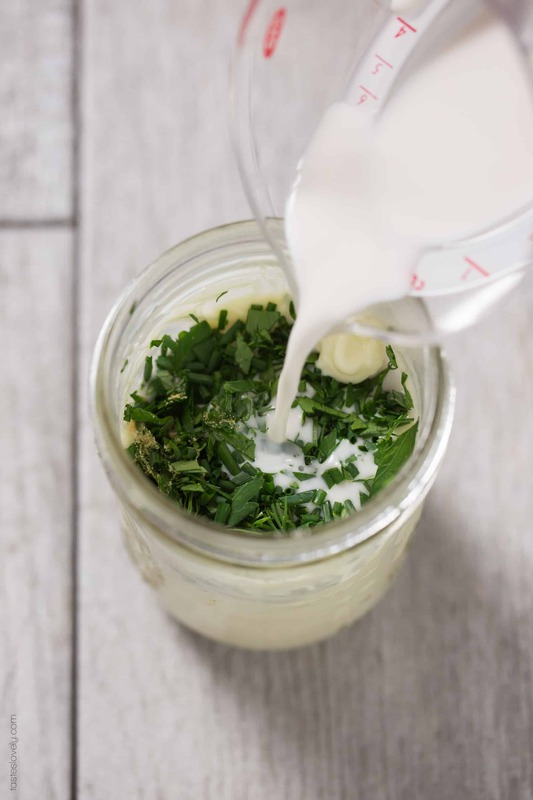 By blending it rather than stirring it, it chops up the herbs even more, which infuses more herby goodness into the dressing. And clean up is so easy, I just need to rinse off my immersion blender. If you can wait, this ranch dressing is best after it has been refrigerated for at least an hour. It gives it time for all the flavors to infuse and marinate. But sometimes, I just can’t wait and dig right in. It’s still good, just not as good. The longer it sits and marinates, the better. 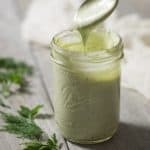 I always have a jar of this homemade paleo and Whole30 ranch dressing in my fridge. I use it as a salad dressing, a condiment on top of meats, but mostly I use it to dip fresh vegetables in for a snack. My toddler loves this ranch too. It’s a great way to get him to eat raw vegetables. I have no guilt about feeding it to him because it is so healthy! All real ingredients. No preservatives. Nothing fake. I can’t believe I used to love store bought ranch so much, when I could have been enjoying this healthier homemade version that is so much more pure. I didn’t know what I missing. Combine all ingredients in a wide mouth pint size mason jar. Insert hand immersion blender and blend on high until combined. Taste for salt and pepper and adjust if necessary. Best if refrigerated for 1 hour before serving so the ranch has time to marinate all the herb flavors. But I’ve eaten this right away before and it’s still good. Just gets better the longer it’s refrigerated! I like my ranch a little thicker, especially so I can easily use it as a dip with vegetables. If you like your ranch thinner, just add an extra tablespoon or more of almond milk until desired consistency. Will keep in an airtight container for 2 weeks. Hey Natalie fun seeing you. 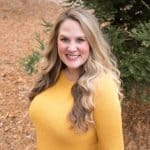 I think I knew you were doing a blog. Happy 4th with your family. Carol P.
This is by far the best Ranch I have ever had in my life! I had given up on ranch with all of the artificial ingredients and MSG added in the powdered version. I will never use another recipe. Thank you so much for this gem! I am so glad you loved it Ashley! Isn’t it horrifying how many awful, fake ingredients are in the powdered version? Can’t believe I ate it for so long. This version is much better, and healthier. Thanks for taking the time to let me know you liked my recipe, you made my day!